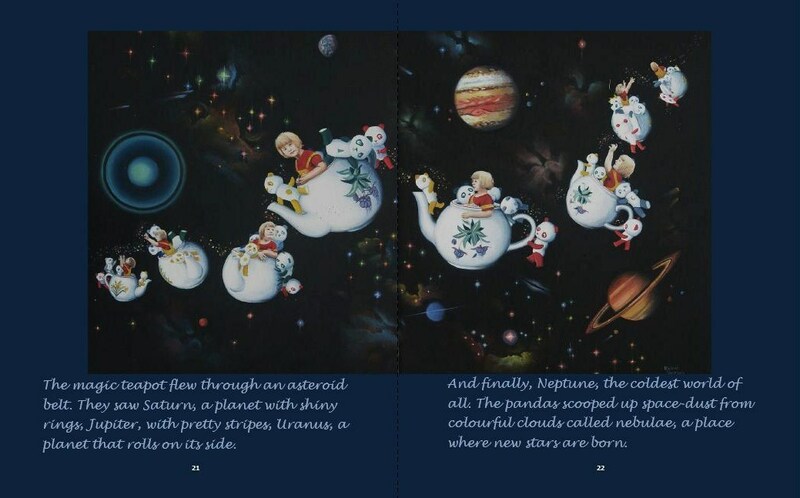 An educational picture book for children with colour images completed in oils, Katie’s Magic Teapot and the Cosmic Pandas takes the reader into a journey through the universe to discover planets, moons, galaxies and other oddities within our cosmos. The journey takes place rather bizarrely within a magic teapot. This story's sequel, Katie & the Cosmic Pandas' Deep Sea Voyage takes them under the sea. The idea started with the images, and the story followed suit. I kept thinking how compelling the sight of a flying teapot throughout the cosmos would be, the sort of picture book I would have liked when I was a child. I have always loved poring over images of the cosmos, where few images compel like the planets Jupiter, Saturn and nebulae. This offered me lots of opportunities to explore painting techniques, using bright colours and interesting compositions. 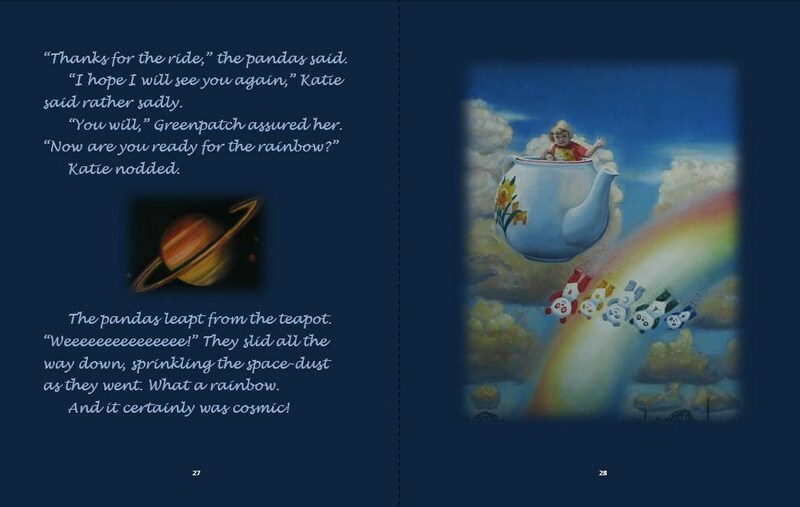 One of my favourite paintings is of a time-lapse image of Katie and the pandas floating through space, in all, featuring eight teapots (see image further down). Katie loved her mummy’s teapot. Her mummy told Katie that it was older than Gran and Gran was very old – and yet the painted flowers had hardly faded at all. Katie thought this odd, but then, there was something very odd about Mummy’s teapot. One day, Katie’s mummy took the teapot from the shelf for a clean. Katie sat and watched. Katie chuckled too. This made her think of a huge teapot. Imagine that! Katie pictured her family and friends gathering outside. The town crier would ring his bell and announce Katie’s momentous tea-party! When Katie opened her eyes, she found to her astonishment that the teapot had indeed grown and she was sitting inside. The teapot began to float. It floated from the table, across the living room and up the chimney. 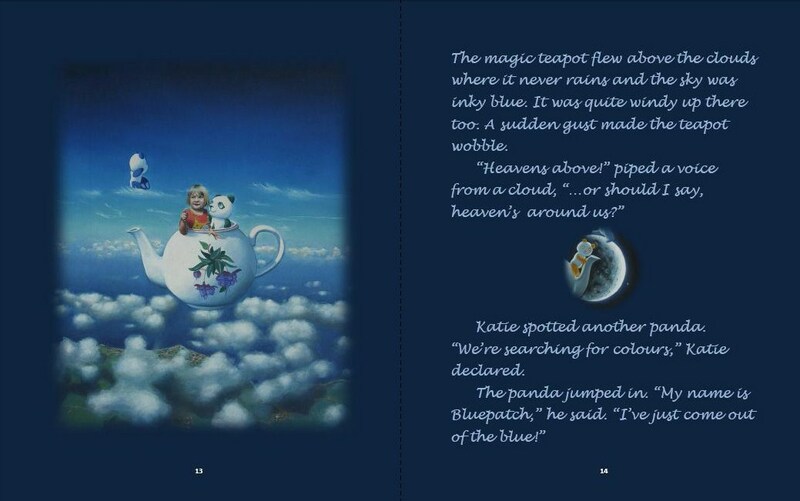 Katie could never have imagined how high the teapot could go, meeting her friends the cosmic pandas along the way. She encounters the moon, Mars, stars, galaxies and more. Each encounter is accompanied by colour illustrations, making this book a visual feast for young learners. I wanted Katie’s journey to be as informative as an enjoyable read. I wrote and illustrated the story over a period of about four months, working intensively upon the paintings. I worked oil on panel of sizes 15x12in for single images, or 24x15in for double paged images. I took lots of photographs of the child subject matter, as children have a habit of moving around. I used an awful lot of black, as you might imagine, but this set the stage for using bright colours on top. I worked on the most detailed parts first when I was feeling most up to it, such as the girl’s face and the detail around the pandas and teapot. Lots of different art techniques were used for effects, including glazing. Glazing entails the application of thin layers of paint, allowing each to dry between. This creates smooth effects for the gradated effects in skies and auras around the planets. I also smudged the paint via a rag over selected areas to emulate nebula clouds. Only the tiniest amount of paint should be used, and smudged thinly. Once dry, a little more can be added to selected areas to give the clouds more form. Smudging via a rag (or even fingers) was used to get the smooth effects for the rainbow. Impasto technique was used in small amounts around the planets and the galaxies. This entails applying thicker layers of paint for opaque colours. Oil pigments were often used neat from the tube, such as the red spot on Jupiter and the flowers on the teapot. 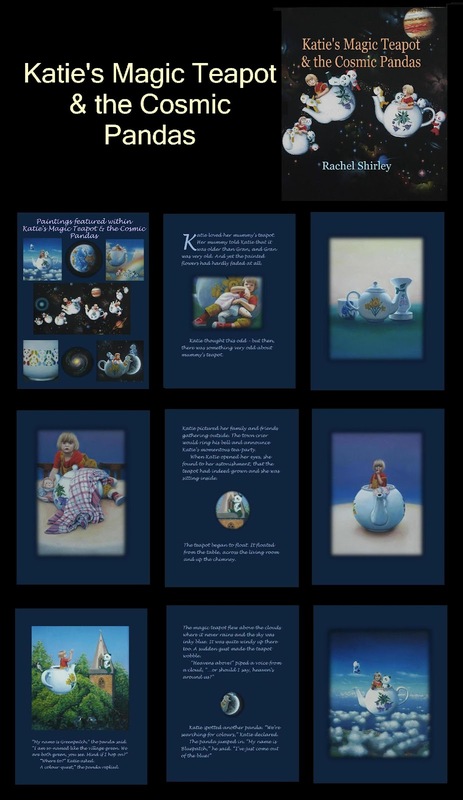 The picture book was hard but enjoyable work, so I decided to write a sequel: Katie and the Cosmic Pandas’ Deep Sea Voyage, which describes Katie’s voyage of discovery beneath the oceans. Both these books are 32 pages, roughly 1000 words long and are 8x10in in size. Both books are available on Kindle and as a printed version from Amazon..
Screenshots on this blog serve to give you an idea of what the interior looks like. Formatting the images and the text just the way I wanted took almost as long as writing the book. This required trying out different fonts, background colours and making sure the elements on each page are balanced correctly, taking into account the page bleeds. I have recently published Katie's Magic Teapot Omnibus Edition, which works out a little cheaper than purchasing the 2 stories.separately. Alternatively, Ben's Little Big Adventure might be an alternative book for young boys.